Rootstock Publishing is pleased to announce that we have adopted these high standards just released by the Independent Book Publishers Association. Here is the IBPA press release with a link to the standards. To give both authors and book industry professionals an at-a-glance method by which to gauge the professional presentation of a book, the Independent Book Publishers Association (IBPA) – ibpa-online.org – today released a 2-page Industry Standards Checklist for a Professionally Published Book. The checklist is broken into two sections, content and production, and provides an unbiased measure by which to critique published books. "The checklist has been established to level the playing field between indie publishers and large-scale conglomerates," said Angela Bole, CEO of IBPA. "Too often, IBPA has noticed a bias against self-published authors, independent publishers, and hybrid presses when it comes to choosing titles or authors for review consideration, book award contests, association memberships, and inclusion on independent bookstore shelves. IBPA’s Industry Checklist for a Professionally Published Book will help industry professionals and independent publishers and authors bridge this gap by offering a structured means by which to ensure that books be judged on merit and quality rather than on the business model used to produce them or the size of the publisher." "Just as publishers, self or otherwise, are responsible for producing books that adhere to industry standards, the book industry as a whole is responsible for creating an environment that allows for equal evaluation of all published works," said Brooke Warner, chairperson of IBPA’s Advocacy Committee. "Today’s independent publishers represent a diverse array of voices and backgrounds, often speaking about specialized issues that are marginalized by larger presses, often because their books are being judged on how the book looks, or its business model, and not on what matters—which is the content of the book." IBPA has long been a champion of independent publishers, both big and small. Changes in the publishing industry in recent years have created enormous opportunities, but that’s come at the cost of a deepening divide between how traditionally published and self-published authors are treated. The Industry Standards Checklist exists to support independent publishers and authors, but also to urge an industry in flux to acknowledge that books ought to be judged on their substance. Thereby, it is IBPA’s hope that this checklist will be a future guide that reviewers, contests, membership associations, and bookstores turn to when deciding which authors merit consideration. 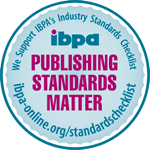 The Industry Checklist for a Professionally Published Book is housed on IBPA’s website at ibpa-online.org/page/standardschecklist, and currently available for any author or industry professional to download. IBPA’s advocacy efforts in this regard, as well as other ongoing initiatives, continue to reinforce the organization’s mission to lead and serve the independent publishing community through advocacy, education, and tools for success. Founded in 1983 to support independent publishers nationwide, the Independent Book Publishers Association (IBPA) leads and serves the independent publishing community through advocacy, education, and tools for success. With over 3,100 members, IBPA is the largest publishing association in the U.S. Its vision is a world where every independent publisher has the tools and knowledge needed to professionally engage in all aspects of the publishing industry. For more information, visit ibpa-online.org.